Mixed rare earth oxides have been prepared from synchysite ore from the Lugiin gol rare earth deposit (Mongolia) which contains about 6% of cerium light rare earth elements. Ore powders were leached for up to 60 min using 80-120 g/l sulfuric acids at an acid to powder ratio of 20, agitation was performed by magnetic stirring followed by precipitation and calcination at 700°C for 1h. The highest leaching of REEs equal to 85% of the total REE was observed in the acid solution of 80 g/l. Obtained mixed rare earth oxides represent a layered type structure. Copyright on any research article in the Mongolian Journal of Chemistry is retained by the author(s). 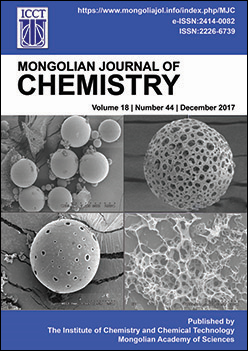 The authors grant the Mongolian Journal of Chemistry a license to publish the article and identify itself as the original publisher. Articles in the Mongolian Journal of Chemistry are Open Access articles published under a Creative Commons Attribution 4.0 International License CC BY.